To Cite: Abedi Jafari F, Oloomi M, Bouzari S. Comparative Effect of Recombinant Shiga Toxin in Induction of Pro- and Anti-Apoptotic Markers and Inflammatory Cytokines in Epithelial and Monocytic Cells, Jundishapur J Microbiol. 2016 ; 9(2):e24758. doi: 10.5812/jjm.24758. Background: Shiga toxins (Stxs, also referred to as verotoxins) are a family of bacterial protein toxins generated by Stx producing-Escherichia coli (STEC), such as E. coli serotype O157:H7. Objectives: The aim of this study was to investigate the effect of recombinant and native Shiga toxin (Stx) in induction of pro- and anti-apoptosis factors and stimulation of immune response to HeLa and THP-1 cells. Materials and Methods: The HeLa and THP-1 cells were used to study the effect of native and recombinant Shiga toxin. For this purpose, 106 cells were cultured overnight in six-well plates and different concentrations of Stx were added to each well. The cells were then collected after 24 hours of incubation. Total RNA and protein was extracted. Firstly, the total RNA was used in reverse transcription-polymerase chain reaction (RT-PCR) for detection of interleukin (IL)-1α, IL-1β, IL-8, tumor necrosis factor (TNF)-α, B-cell lymphoma (Bcl)-2 and Bcl-xl transcript. Protein expression of pro- and anti-apoptotic factors was also confirmed by western blot analysis. Results: The IL-1α and IL-8 were increased by recombinant and native Stx. Interleukin-1β was detected in THP-1, while TNF-α was detected HeLa cells. Furthermore, Bcl-2 and Bcl-xl expression was observed in HeLa cells. However, expression of Bak was reduced by recombinant Stx and native toxin at the protein level, while Bcl-xl expression was increased. Conclusions: These results suggest that toxins induce inflammatory responses, particularly through expression of chemokine. Recombinant Stx and native toxin induced apoptosis by balancing between different pro- and anti-apoptotic Bcl-2 family-factors in epithelial cells. In this study, for the first time, recombinant and native Stx induction of apoptotic factors and stimulation of immune response to HeLa and THP-1 cells were compared. Shiga toxins (Stxs, also referred to as verotoxins), a family of bacterial protein toxins generated by Stx producing-Escherichia coli (STEC), such as E. coli serotype O157:H7, are believed to cause hemorrhagic colitis and hemolytic uremic syndrome (HUS) (1, 2). Shiga toxins are amongst AB5 toxins, which consist of a single A subunit and a pentamer of B subunits (3-6). The B subunit of Stx (StxB) is a peptide used for the attachment of the holotoxin to the cell surface by binding to the functional receptor globotriaosyl ceramide (Gb3/CD77) (3). The Stx A-subunit is responsible for depurinates adenine residue from eukaryotic rRNA, leading to protein synthesis inhibition (6, 7). Shiga toxins and bacterial components, such as lipopolysaccharides (LPS), are important factors in sensitizing cells by secretion of pro-inflammatory cytokines, tumor necrosis factor (TNF)-α and interleukin (IL)-1β, which upregulate genes involved in Gb3 biosynthesis in some cell types (8). These toxins also activate signaling pathways that consist of toxin uptake and intracellular routing. Shiga toxins-1 treatment of a human renal epithelial cell line resulted in increased tyrosine phosphorylation of lipid raft-associated proteins after toxin exposure (9). It has been shown that Stx-containing endosomes are routed to different intracellular compartments in a cell-specific manner (10). Apoptosis is one of the signaling pathways induced by Stxs. Critical regulators of apoptosis are members of the B-cell lymphoma (Bcl)-2 protein family. The Bcl-2 family proteins may be pro- or anti-apoptotic effectors. B-cell lymphoma-2 localizes the surface membrane of organelles, and can be expressed on the nuclear membrane, endoplasmic reticulum and mitochondrial membrane (11). Furthermore, Bcl-2 is unique in that it inhibits apoptosis rather than promoting cell proliferation. Multiple genes have been identified within the Bcl-2 family; some of these genes, such as Bcl-xs, Bax and Bak, drive the death mechanism and others, such as Bcl-2 and Bcl-xl, act against apoptotic cell death (11, 12). The aim of this study was to investigate whether recombinant and native Stx could influence the expression of known Bcl-2 family of apoptotic proteins. Moreover, their association in inducing pro-inflammatory cytokines on HeLa and THP-1 cells was also examined. The E. coli strains O157 (national E. coli reference laboratory) were grown overnight in 50 mL of Luria Bertani (LB). The cultures were centrifuged and the pellets sonication was done five times at 600 rpm for 10 minutes, followed by further centrifugation at 6000 rpm for 10 minutes. This suspension of toxin was sterilized by a sterile filter (Schleicher and Schuell, Germany). Shiga toxins as holotoxins were obtained from already cloned genes in pBAD expression vector with L-arabinose; the best concentration of L-arabinose was 2% (13). The toxins were sterilized by filtering through a sterile filter (Schleicher and Schuell, Germany) and the protein concentration of Stxs was estimated by the Bradford method. The purified Stxs were assessed by sodium dodecyl sulfate (SDS) page electrophoreses. Western blotting and protein expression was confirmed by the enzyme linked immunosorbent assay (r-biopharm, RIDASCREEN® Verotoxin) as already described (13, 14). The THP-1 and HeLa cells (national cell bank, Pasteur institute of Iran) were grown in Roswell park memorial institute 1640 medium (RPMI 1640) (Biosera, France), with 5% heat-inactivated fetal bovine serum (FBS), 1% (w/v) penicillin/streptomycin at 37°C in a 5% CO2 incubator. The HeLa and THP-1 cells (106 cells per well) were plated in six-well plates and incubated to grow in complete RPMI 1640 medium. Then after 24 hours, different concentrations of recombinant Stx and natural Stx were added to the prepared medium, and cells were incubated for an additional 24 hours. Samples were collected and treated cells were analyzed. Media were moved to centrifuge tubes to detach the adherent layer, and trypsin/ethylene diamine tetraacetic acid (EDTA) solution was added to each well, followed by several minutes of incubation at 37°C. The detached cells were then transferred to the same tubes containing the initial media; and samples were collected by centrifugation. The total RNA was extracted from collected samples. For reverse transcription-polymerase chain reaction analysis (RT-PCR), total RNA was extracted using an RNA isolation kit (Takara Biotech Co. Japan) in accordance with the supplier’s protocols. The RT-PCR for each sample was performed in 50 μL of reaction mixture containing 1-10 μg of cellular RNA (O157, rStx and control cell) in a 50 μL reaction mixture, containing 2 µM of a forward primer, 2 μM of a reverse primer, 1 μM of each deoxynucleoside triphosphate, 30 μL double distilled water (DDW), 0.5 unit enzyme and 10 μL of buffer. The PCR was run in an eppendorf PCR system with initial denaturation at 50°C for 30 minutes, 30 cycles at 95°C for 15 minutes, 94°C for one minute, 54°C for 15 seconds, and 74°C for one minute. Primers that were used in this study are listed in Table 1. The RNA quality was controlled by PCR using primers for glyceraldehyde 3-phosphate dehydrogenase (GAPDH) amplification. Cells (106) were lysed with 2x sodium dodecyl sulfate (SDS) sample buffer and were boiled for two minutes. The lysate was sonicated five times at 600 rpm for three to four seconds. Samples with equivalent concentrations of the protein were run in 15% SDS-PAGE and electroblotted onto a nitrocellulose transfer membrane. Blots were blocked with 5% skim milk in phosphate-buffered saline plus 1% Tween-20 overnight at 4°C. Then, they were washed three times with washing buffer (tween phosphate-buffer saline (TPBS) phosphate-buffered saline plus 1% tween-20), 10 minutes in duration each time. 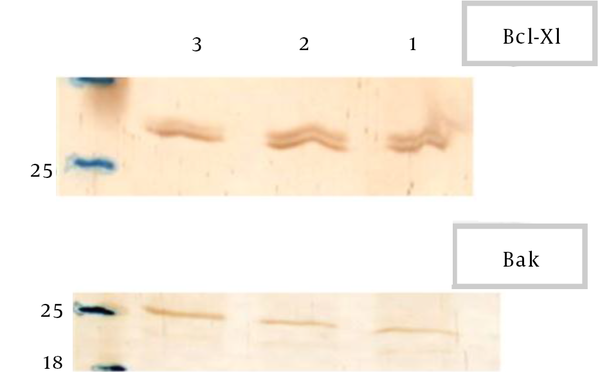 Separate blots were then incubated with anti-Bcl-2 (0.2 μL/mL), anti-Bak (0.2 μL/mL) and anti-Bcl-Xl (0.2 μL/mL) antibodies. The blots were incubated for two hours at 37°C, and then washed with phosphate-buffered saline plus 1% Tween-20, followed by further incubation for one hour with horse peroxidase-conjugated anti-gout immunoglobulin antibodies (HRP) and a final wash with TPBS. Immunoblots were mixed with the chromogen substrate (5 mL TPBS, 5 µL H2O2, 3 mg 3´3-diaminobenzidine (DAB)) and were incubated in a dark room. Recombinant Shiga toxin expression was confirmed by enzyme-linked immunosorbent assay (ELISA), SDS-PAGE, and western blotting with rabbit-antibodies, A and B antibodies was already raised from purified subunits in our previous work (14). To investigate immune response induction in treated cells, the release of cytokines was examined by RT-PCR. The RNA quality was assessed by PCR using primers for GAPDH. 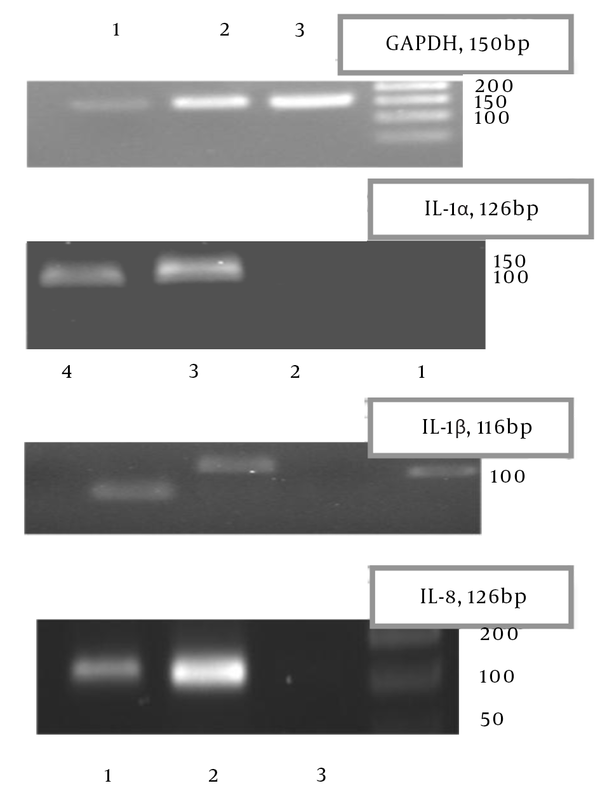 The induction of IL-1α, IL-1β, IL-8 and TNF-α was then examined (Figure 1). Recombinant and native Stx failed to induce IL-1β expression in HeLa cells. However, IL-1α and IL-8 expressions were indicated; TNF-α expression in HeLa cells was only induced by rStx treatment. RNA quality was assessed by PCR using primers for GAPDH. The induction of IL-1α, IL-8 and TNF-α were examined.1, HeLa cell treatment with native shiga toxin; 2, HeLa cell treatment with recombinant toxin, ; 3,control HeLa cell RT-PCR by GAPDH, IL-1α, IL-8, TNF-α. To investigate immune response induction in treated cells, the release of cytokines was examined by RT-PCR. The RNA quality was also evaluated by PCR using primers for GAPDH. 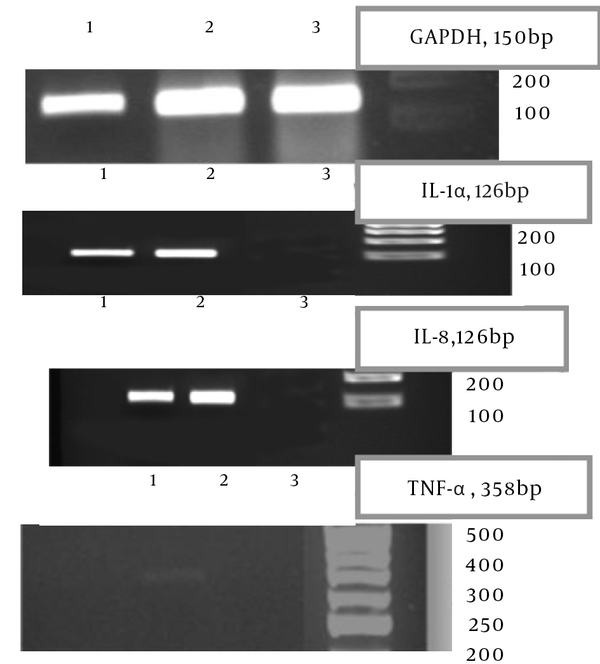 Next, induction of IL-1α, IL-1β, IL-8, and TNF-α was examined (Figure 2). Recombinant and native Stx failed to induce TNF-α expression in THP-1 cells. This is because, IL-1α, IL-1β and IL-8, expression were detected by rStx treatment as compared by native Stx. RNA quality was assessed by PCR using primers for GAPDH. The induction of IL-1α, IL-1β and IL-8 was examined. 1; THP-1 cell treatment with native shiga toxin; 2, THP-1 cell treatmment with recombinant toxin; 3, control THP-1 cell. To determine the apoptotic effect of native and recombinant Stx on THP-1 and HeLa cells, overnight (O/N) culture of cells was incubated with native and recombinant Stx. The cells were washed with phosphate-buffered saline (PBS) and treated with different concentrations of native and recombinant Stx. Then the collected cells were used for detection of apoptosis. Total RNA and protein were extracted. Firstly, the total RNA was used for the RT-PCR assay. Pro- and anti-apoptotic factors in THP-1 and HeLa cells were evaluated by recombinant and native Stx treatment. In THP-1 cells, Bcl-2 and Bcl-xl expressions were not induced while in HeLa cells, Bcl-2 and Bcl-xl inductions were detected (Figure 3). 1, Treated HeLa cell with native shiga toxin; 2 treated HeLa cell with recombinant toxin ; 3. control HeLa cell.. 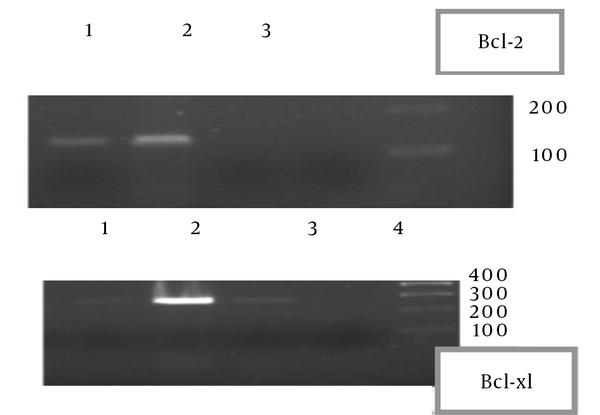 Protein was extracted and it was used in western blot analysis for detection of anti and pro-apoptotic factors (Bcl-2, Bcl-xl and Bak). Recombinant and native Stx failed to induce Bcl-2 expression in HeLa cells. Expression of Bak was reduced by recombinant and native Stx, while expression of Bcl-xl was increased in HeLa cells (Figure 4). 1,HeLa cells treated with native shiga toxin ; 2, recombinant toxin ; 3, control HeLa cells..
Globotriaosylceramide (Gb3) and globotriaosylceramide (Gb4) are proposed functional receptors for Stxs. The expression of Gb3 in human cancers, raises the possibility that Stx could be used for targeted therapy and imaging of tumors (15). Several components of the Gb3 metabolic pathway may be involved in cytokine-stimulated Gb3 expression. Cytokines are crucial in the regulation of a variety of molecular and cellular events in inﬂammation (16). In this study, we demonstrated that recombinant and native Stx induce IL-1α mRNA in HeLa cells and THP-1 cells after 24 hours. These findings suggest that recombinant Stx triggers an immune response through the expression of inflammatory cytokine in epithelial and monocytic cells. Interleukin-1β has been postulated as one of the pro-inflammatory cytokines inducing the enhancement of Stx2 toxicity in vitro. Palermo et al. found that IL-1β has a protective role against Stx2 toxicity in vivo (16). In our study, induction of IL-1β in HeLa cells was not shown although in THP-1 cells induction of this cytokine was detected by rStx after 24 hours. We also found that stimulating HeLa cells with recombinant Stx induce TNF-α, yet the production of TNF-α was not detected with native Stx. In the study of Palermo et al. induction of this cytokine was not shown in THP-1 cells after 24 hours. These data refer to differentiations between rStx and native Stx. Native Stx includes Stx with other components of cells, such as lipopolysaccharide (LPS), which is one of the important bacterial components that can stimulate cells to show different responses. Palermo et al. demonstrated that LPS was able to reduce or enhance Stx2 toxicity, depending on the dose of the injection (16). On the other hand, chemokines are a family of pro-inflammatory cytokines, represented in this study by IL-8. Human IL-8 is a pro-inflammatory chemokine secreted predominantly by monocytes, endothelial cells, and glial cells and acts as a chemo attractant (17). In this study, elevated levels of IL-8 mRNA were found in toxin-treated HeLa and THP-1 cells in comparison to the untreated controls. HeLa cells (Gb3+ cervical adenocarcinoma) express keratins and possess an epithelial morphology. Fujii et al. carried out an extensive characterization of the HeLa cell response to Stxs (18). The toxins induced apoptosis with more than 60% cell death after toxin treatment. HeLa cell apoptosis required toxin enzymatic activity and was characterized by activation of caspases. Caspase-specific peptide inhibitors for caspases blocked Stx1-induced apoptosis. Shiga toxins failed to induce Fas, TNF-α and IL-1β expression in HeLa cells. Monocyte-like THP-1 cells underwent apoptosis when treated with Stx1, with greater than 80% cell death after toxin treatment. Differentiated macrophage-like THP-1 cells underwent apoptosis with Stx1 treatment, yet the kinetics of cell death were significantly delayed compared with undifferentiated, monocyte-like cells, with only 11% cell death after toxin treatment (19). Cell death signaling in monocytic THP-1 cells was similar to that of HeLa cells yet not the monocytes. This suggests an intrinsic or mitochondrial pathway for apoptosis induction (19-21). We found that by stimulating HeLa cells with recombinant Stx, anti-apoptotic factors such as Bcl-xl mRNA were increased after 24 hours. This is another difference between native Stx and recombinant Stx. We also found that by stimulating HeLa cells, with recombinant Stx and native Stx, inflammatory cytokines, such as IL-8 and IL-1α, were produced. Elevated levels of IL-8 and IL-1α mRNA were found in toxin-treated cells in comparison to the untreated controls. In addition, we demonstrated that Bcl-2 mRNA increased after 24 hours in HeLa-treated cells. In summary, our results suggest a possible relationship between excessive chemokine, IL-1α and TNF-α production in HeLa cells. Increased induction of anti-apoptotic factors and decreased induction of pro-apoptotic factor was also shown. In conclusion, in this study we demonstrated important features of the recombinant Stx compared to native Stx: (i) rStx decreased the induction of pro-apoptotic Bcl-2 family and increased the induction of anti-apoptotic Bcl-2 family after 24 hours. (ii) TNF-α, IL-1α and IL-8 have been postulated as pro-inflammatory cytokines induced by the Stx treatment in monocytic THP-1 and HeLa cells, except TNF-α production in HeLa cells and IL-1β production in monocytic THP-1 cells. (iii) Cytokines pro-inflammatory induction could have a protective role against Stx apoptosis after 24 hours, and it would be in association with balancing the induction of anti-apoptotic Bcl-2 family. Authors’ Contribution: Study concept and design: Mana Oloomi; acquisition of data: Fatemeh Abedi Jafari; analysis and interpretation of data: Fatemeh Abedi Jafari, Mana Oloomi; drafting of the manuscript: Fatemeh Abedi Jafari, Mana Oloomi; critical revision of the manuscript for important intellectual content: Mana Oloomi, and Saeid Bouzari; statistical analysis: Fatemeh Abedi Jafari; administrative, technical, and material support: Mana Oloomi; study supervision: Mana Oloomi. Financial Disclosure: This study was supported by a grant from the Pasteur institute of Iran. There are no relevant financial interests and no conflicts of interest. Funding/Support: This study was supported by the Pasteur institute of Iran.